The “private job” option within the ProEstimate Network version allows users to hide projects from other users within the system. 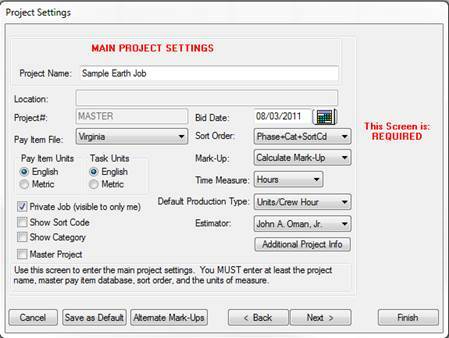 Once a project is marked as private, the project list will only display the selected project for the estimator that is set up on the project. Possible uses for this option would be to allow an estimator to create preliminary estimates that he would not want other users in the system to have access to or be able to change. In order to use this option, you must assign unique passwords to each user within the security system AND each user must log in using their unique password. To mark a project as a Private Job, go to the project settings screen and you will need to assign the estimator to the project AND check the “Private Job” option on the same screen as shown on the screen below. As mentioned previously, “private jobs” will only be visible on the project list to the estimator who is assigned to the project. Also, system administrators will see all private projects. TIP: This option is able to be turned on or off anytime. Simply un-checking the “Private Job” option will make the project visible again to all users.